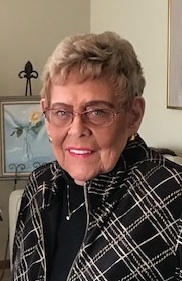 Mary Ann Suedbeck of Plymouth, Minnesota, passed away on Thursday, March 28, 2019 at North Memorial Health Care in Robbinsdale, MN at the age of 89. She was born on November 8, 1929 in Hadley, Minnesota to Harry C and Bertha E (Thorson) Jacobson. Mary Ann graduated from Slayton High School in Slayton, MN in 1947 and attended Augustana College in Sioux Falls, SD. Afterwards, she worked at the Murray County State Bank. Mary Ann was united in marriage to Edward Suedbeck on November 3, 1951. They moved to Baltimore, Maryland, where she worked at Union Trust Company. They later returned to Slayton, where Mary Ann worked at Hafner’s Style Shop, which became Burkland’s Style Shop. Mary Ann enjoyed golfing, playing bridge, and visiting with people. She will be remembered for her amazing memory and attention to detail. Mary Ann will be dearly missed by her family and friends. MaryAnn is survived by her three children Kari (Thomas) Podenski of New Hope; Kathy (Rodney) Peterson of Plymouth; and Scott (Michele) Suedbeck of Burr Ridge, IL; five grandchildren Sarah (Jacob) Sinderbrand of St. Paul; Zachary (Christina) Podenski of Marietta, GA; Reid Peterson of Minneapolis; Jack Suedbeck and Jadyn Suedbeck of Burr Ridge, IL; two great-grandchildren, Carlo and Marie Podenski of Marietta, GA; sister Avis VandeBraak of Slayton; and many nieces and nephews. She is preceded in death by her beloved husband Edward; her parents; her sisters Maxine (Robert) Keller and Bette Payton-Taylor. Mary Ann’s family extends their heartfelt thanks to Janet Manya, who provided her care and assistance and helped make her life so much better. Christ Lutheran Church in Slayton, Minnesota on Friday, April 5, 2019 at 10:30 AM with Rev. Grant Fischer officiating. The honorary pallbearers are grandchildren Sarah Sinderbrand, Zachary Podenski, Reid Peterson, Jack Suedbeck, and Jadyn Suedbeck. Interment will be at St. Ann’s Cemetery in Slayton, MN. Mary Ann gave the gift of life through tissue donation. Visitation will be Thursday, April 4, 2019 from 4-6 p.m. at Christ Lutheran Church and also one hour prior to the services at the church on Friday. Totzke Funeral Home of Slayton is entrusted with arrangements. To send condolences visit totzkefuneralhome.com. Memorials may be directed to Christ Lutheran Church in memory of Mary Ann.